The Executive Director of the Clean Air Council, Joseph Otis Minott, had the nerve to respond to a recently published report by the Pennsylvania Department of Environmental Protection’s public health study on unconventional natural gas operations, also known as hydraulic fracturing, by saying the report’s findings “are consistent with other recent public health studies, which demonstrate that unconventional natural gas operations CAN POSE SERIOUS RISKS OF HARMFUL IMPACTS TO SENSITIVE AND VULNERABLE POPULATIONS IN THE COMMONWEALTH, WHICH INCLUDES CHILDREN.” (Caps mine) The level of Mr. Minott’s mendacity is staggering and reprehensible. Shale gas air impacts are limited, according to a recent study by Pennsylvania DEP, but Clean Air Council fractivists simply deny the reality, of course. …in July 2012, the Department initiated a long-term, one-year ambient air monitoring project of Marcellus shale development to understand further the impacts of the shale gas industry on Pennsylvania’s overall air quality. 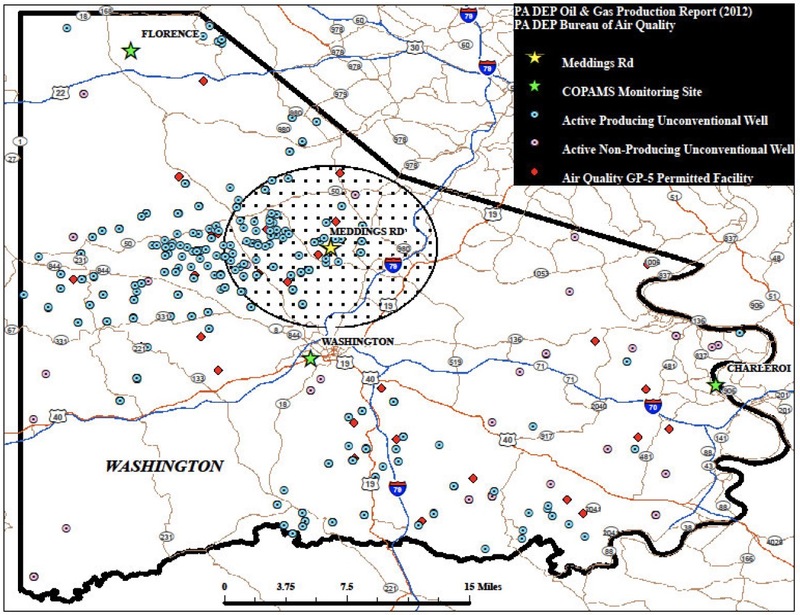 The project placed emphasis on characterizing concentrations of criteria and hazardous air pollutants near permanent facilities related to the Marcellus Shale gas industry in Washington County, Pennsylvania. Washington County was specifically chosen because it was the first county to commence extraction from Marcellus Shale in Pennsylvania. Also, with the county’s continued natural gas field development, it has significant permanent gathering and treatment infrastructure either in place or in late-term development. While the primary goal of the long-term project was to “determine any chronic or long-term risks to the public from individual or multiple shale gas sources,” there were three basic goals associated with this project. The first goal included examination of both toxic/hazardous air pollutants (HAP) and criteria pollutants. The second goal was to identify and assess potential increases in ambient concentrations of criteria pollutants in the project area over the duration of the project and to compare observed ambient concentrations to historical data collected both in the project area and other existing monitoring locations within the Commonwealth. The long-term study included four specific air quality monitoring sites in Washington County. The sites included Meddings Road, Welsh Road, Jaspen Way, and Henderson Road. Each site was determined to be sufficient to characterize ambient air concentrations of criteria and/or toxic pollutants and meteorology in the study area potentially affected by emissions from the oil and gas operations. Data for target pollutant concentrations was collected at the project sites over a one-year period. The data was analyzed and compared to other sites in the project area and to a historical ambient air monitoring site in the rural setting of Arendtsville, Adams County, where no oil or natural gas production occurs. The data was processed using validation and usability determinations prior to being analyzed for comparison to primary and secondary National Ambient Air Quality Standards (NAAQS) for criteria pollutants. Toxics/HAP data were validated and quality-assured using United States Environmental Protection Agency (U.S. EPA or EPA) methods for non-criteria pollutant data collection and consistent with guidance for data analysis for the National Air Toxics Trend Station (NATTS) program. The primary criteria pollutant monitoring site, Meddings Road, did not report NAAQS-related values for any of the monitored criteria pollutants (e.g., Ozone, NO2, PM2.5, CO) which exceeded the applicable NAAQS or indicated a probable future exceedance based on the data pattern. In addition, the pattern of recorded pollutant concentration measurements did not indicate a localized source impact which would cause an exceedance of any of the NAAQS evaluated. The Meddings Road site measured significantly fewer Air Quality Index (AQI) days less than “Good” than local comparison sites. The site measured 93 days classified as “Moderate” and one day classified as “Unhealthy for Sensitive Groups.” In comparison, the Charleroi site measured 195 “Moderate” days and three “Unhealthy for Sensitive Groups” days. The Florence (a background impact site) measured 160 “Moderate” days and two “Unhealthy for Sensitive Groups” days. There was no significant difference in either cumulative estimated Excess Lifetime Cancer Risk (ELCR) or cumulative chronic non-cancer Hazard Quotient (HQ), also known as the Hazard Index (HI), between the four ambient air impact monitoring sites and the background site. The estimated ELCR for each of the five project sites fell between one in one million (1.0E-6) and one in ten thousand (1.0E-4). This is an acceptable range of ambient air inhalation risk for risk assessment screening purposes. Observed concentrations at sites were below levels where a chronic non-cancer hazard would be expected to manifest over a 70-year lifetime of exposure. But, Joe Minott says the study demonstrates “unconventional natural gas operations can pose serious risks of harmful health impacts to sensitive and vulnerable populations.” Sure, Joe, sure. Keep spinning. Keep crying wolf. That’s what they pay you do I guess.